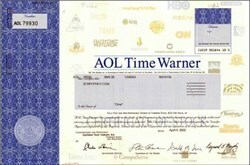 Beautifully engraved uncancelled stock certificate from the AOL Time Warner Company. This historic document was printed by the American Banknote Company. The certificate has the logos of all their major companies including America Online, CNN, Looney Tunes, Netscape, Digital City, Mapquest, MovieFone, Turner Broadcasting, Home Box Office, Time Inc., Time Warner Trade Publishing, Warner Bros., New Line Cinema, Warner Music Group, Time Warner Cable, CompuServe, Sports Illustrated and more. Gerald Levin as CEO and Steve Case as Chairman. Levin retired in May 2002 and Case retired in May 2003 and the shareholders lost $200 Billion in value. This historic certificate has the printed signatures of the Company's Authorized Officers including Steve Case as Chairman of the Board and Gerald Levin as Chief Executive Officer. 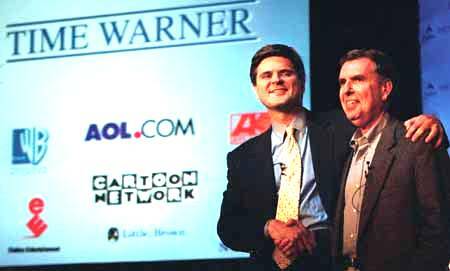 AOL Time Warner was the world's largest media and Internet company.